It’s a well known fact that Indigo is one of Trent Barton’s most successful and thus profitable routes. With a historic frequency of every 6-7 minutes it’s also their most frequent. A staggering 9 travel between Nottingham, Beeston and Long Eaton, from where buses continue to Briar Gate and Derby every 20 minutes. Old and New Sawley are served hourly and half-hourly respectively. 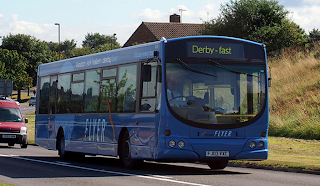 Very few people would use it to travel from Derby to Nottingham, there are much quicker options, but it is a route that connects a lot of places and that is no doubt where its successes lie. It’s only been known as Indigo since 2008. Prior to that, it was known as Rainbow 5. The flyer below shows a somewhat different approach to branding to what is currently applied, but shows a somewhat different route. The Rainbow 5 itself was a three-bus-an-hour affair, what is currently the Derby leg. It was supplemented by the 5A (the Briar Gate leg) and 5B (extensions to New Sawley, Old Sawley and Loughborough) to form a ‘super-route’ into Nottingham. These were operated at the time by a mix of ‘S’ and ‘X’ plate Optare Excels, the last of which (234) has only just been withdrawn from the fleet. 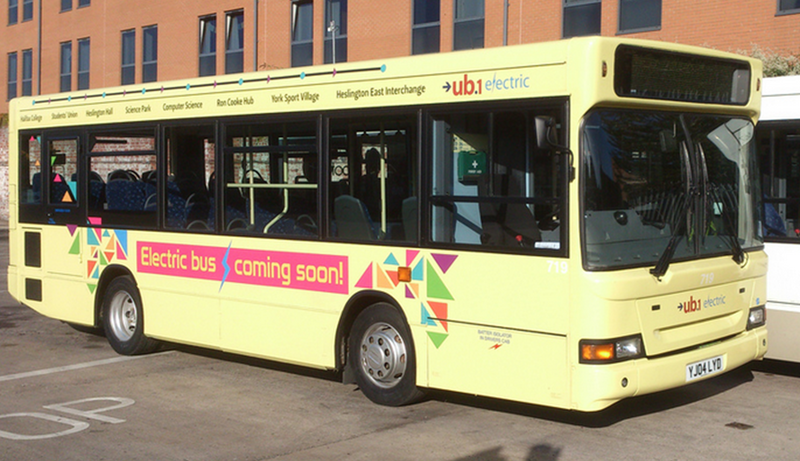 Rainbow 5 was the first route to gain Scania/Wrightbus Solars and was also the first route to gain the new Stenning designed Trent Barton identity in 2003. The ‘A’ and ‘B’ were done away with, with buses simply displaying ‘5’ and their destination. In 2008, the route was the first to receive Volvo Wirghtbus Eclipses. After much delay, resulting in the fleet being re-registered as ‘58’ plates, they entered service, giving the new route and a touch of class; featuring leather seats, air conditioning and wood laminate flooring. After a successful trial on Rainbow 4 (now i4) and Commuter Xprss (now Club Class), Indigo was the first to receive technology to allow the use of the Mango smartcard. A total of 25 Eclipses were delivered for Indigo, making it the route with the biggest number of allocated buses. In 2011, Indigo became the first commercial route in the East Midlands to run 24 hours a day, seven days a week. The Eclipses were given subtle branding changes, with orange “24/7” stickers being applied. From today, the biggest change to Indigo will take place. The whole timetable has been torn apart, travel trends have been examined and a whole new offering is about to be unleashed. Buses will now run every five minutes between Nottingham, the QMC, the University and Beeston. Offering a £1 cash fare, Indigo is now a particularly attractive service to students and a real contender in the heavily fought corridor. Buses will continue to Long Eaton every 10 minutes during the day, with there being a 5 minute frequency at peak times. Of these, half will continue to Derby (alongside the new Zoom) and the other half will continue to Briar Gate. 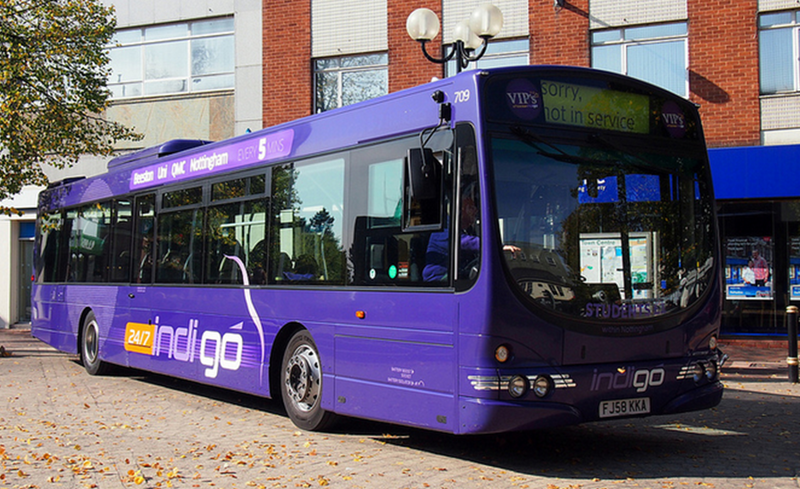 With the exception of a few peak time journeys, Indigo will no longer serve Sawley. Instead, a new Sawley Xprss service will run, every hour, from Nottingham fast to Long Eaton, before serving both Old and New Sawley. This service will be ran by Optare Solos, the dedicated two having been painted into the newest incarnation of the Mango livery. These are massive changes and aren't ones made without a lot of thought and investigation. Indigo always has and no doubt will continue to be a fantastic and popular product and a complete re-think will no doubt result in the service being even stronger into the future. I wish Barry, as Indigo manager, and all the team all the best of luck with the new and improved Indigo. Whilst certainly not of the same magnitude as the one in the East Midlands, there is something of a ‘bus war’ happening in York. Several years ago, the University of York opened up its new campus, some two miles away from the old one. The University offered to subsidise an extension of First York’s route 4 from the old campus to the new, however, given the cost of a new Wright Streetcar (used on the route at the time) they declined. As such, the University turned to York Pullman, who introduced their 'Unibus’ 44 service. This route largely followed the 4 from the train station, but due to the use of ‘normal’ buses, they could serve Merchangate, a street closer to the major shops. Of course, there was also the extension to Heslington East. The broader range of destinations, the cheaper fares and encouragement from the University quickly made the 44 many students’ route of choice. First retaliated by extending their route to Heslington East, but without the subsidy and without the use of the University’s campus road. Both services offered free campus hops, but without a subsidy, First were at a distinct disadvantage. The 44 was clearly winning the fight. Last September, First decided to put their cards on the table, and ran the 4 every 7/8 minutes, in the hope that they would offer a better product than the 44. By doing so, however, they withdrew from Heslington East, at the same time as a 1,200 halls of residence opened there. The 44 struggled with capacity to the point where it went to a 7/8 minute frequency from Christmas. First’s plan had quite simply failed. During this ordeal, First not only lost a lot of custom but also fell out of favour with the University. Trandsdev (Pullman’s successor) are the University’s “preferred transport provider.” Fortunately it seems they may have been given the opportunity for a reprieve. This year, the University has been overwhelmed with incoming first year students, and the University guarantees all of them accommodation. Demand has outstripped supply and this has resulted in some private sector accommodation being hired by the university and let out as their own. The University is obliged to get these students from their homes, in various estates around York, to the University. Given First’s comprehensive network, it was inevitable that they would be approached. As such, their service 4 once again returns to Heslington East, to allow connections from Acomb to the south of the city. Furthermore, for the first time, their service 6 will be extended to Heslington East interchange, allowing a direct bus to Osbaldwick, Tang Hall, the Hospital and Clifton Moor. Great new links for students and minimal expenditure for First. This improved network could also prove to be a lifesaver for the 4, which does seem to struggle due to the competition. They haven’t been involved as Transdev of course. Their 44 continues to run every 7/8 minutes with the support of the University and Student’s Union. That's alongside an improved 'CB2 clubber's bus" service, which runs during the small hours of the morning, 3 days a week. But that isn’t the only route they run through the University. The UB1 is a free campus shuttle, paid for by the University. For the next term, this is to be run by an MPD, sourced from elsewhere within the Blazefield group which replaces a Plaxton Primo that was inherited from Pullman. The Primo is said to have been exported to New Zealand. 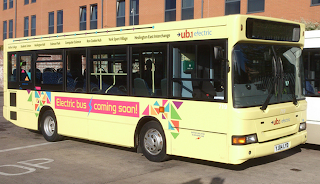 The MPD advertises its successor, an Optare Solo EV, purchased with the help of the Green Bus Fund, which is due in service after Christmas. Also run by Transdev, The 20 shopper service links the University’s two campuses with Monks Cross and Clifton Moor, two popular shopping parks. The service is part funded by York City Council but also part funded by the University, allowing students to get discounted tickets. 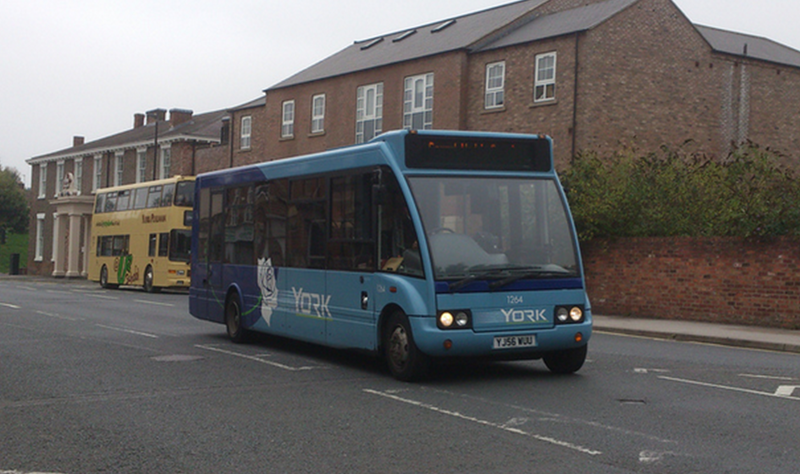 Transdev York’s older sister, Coastliner, also run a service to the University. The half-hourly 844 was set up in retaliation of First’s attempts to run a Leeds to York service, in competition with Coastliner. The extension to the University isn't especially popular so maybe Transdev are hoping the latest intake may show some interest. One service not to be operated by Transdev this year is the 27. This service, operated under contract to York City Council, ran from the City Centre to the University via Fulford. This, along with a number of services interworked with it passed to Arriva Selby from Transdev a few months ago, thus massively increasing their presence in York. Alongside this, whilst out and about over the past few days, I have noticed, on several occasions, an Arriva double decker driving not in service through the University, with a number of drivers on board. Could the competition for the University be about to see another player? Or will yet another destination be available to the students of York? All the pictures included are (c) Nelboy MazeTeam on flickr. To see his interesting and up to date photostream, click here. 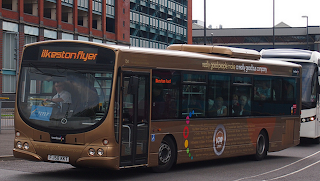 After years of focussing their efforts on building up a portfolio of contract work and competitive services against Nottingham City Transport (NCT), in February Yourbus decided that they would attempt to take on Trent Barton’s flagship Red Arrow coach service, between Derby and Nottingham. 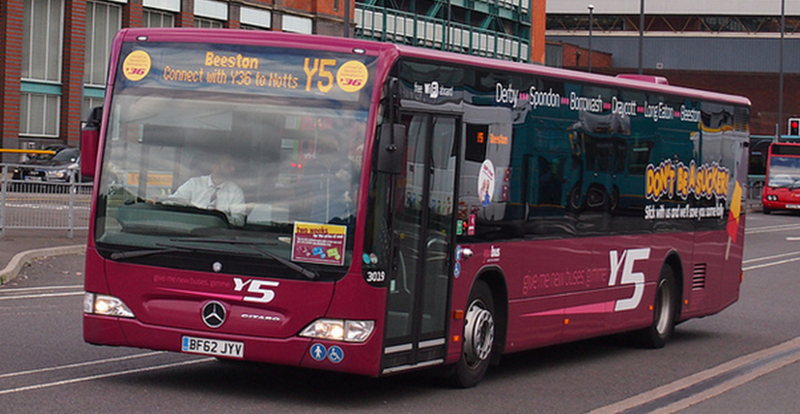 Using a fleet of branded Mercedes Citaro buses, they would match Trent Barton’s 10 minute frequency. This approach failed, with a lot of empty Citaros running up and down the A52. Yourbus decided to continue running the service but at half the frequency, buses now run every 20 minutes. The buses that were taken off the Citylink service were redeployed onto a service, the Y5. 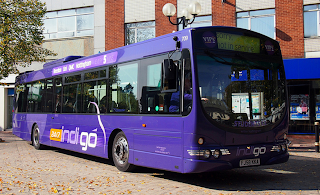 This copied Trent Barton’s Indigo service between Beeston and Derby, running at the same 20 minute frequency as its competitor. This prompted the launch of ‘Zoom’ by Trent Barton, which was discussed in yesterday’s post. Brand new Mercedes Citaros were also deployed onto new routes. 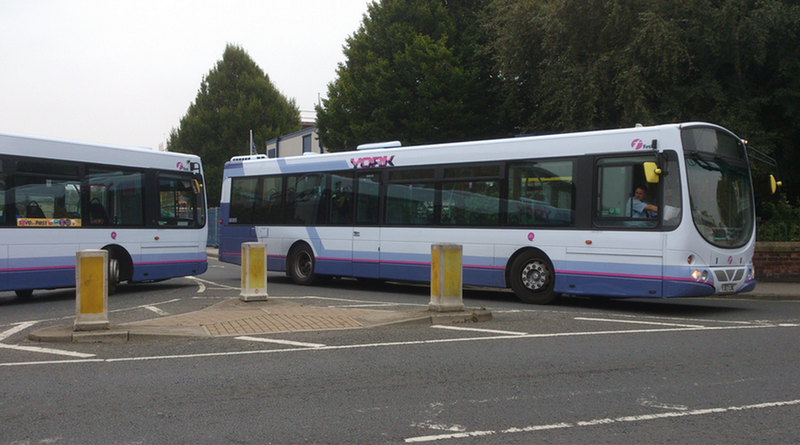 The Y1 was a copy of Trent Barton’s H1 and the Y3 was a carbon copy of the Ilkeston Flyer. Both ran at the same frequency of every 20 minutes. Trent Barton’s response to this was to increase the frequency of both routes to four buses an hour. It appears that a consortium involving Trent Barton and Nottingham City Transport has won the contract to run the University of Nottingham’s hopper buses off Yourbus. This contract is rumoured to be worth a lot of money and the fact that the two companies are working together suggests an attempt to reduce Yourbus’ guaranteed income. Y5 is the second route Yourbus introduced in direct competition with Trent Barton. So, as you can tell, the whole affair is getting a little nasty. And it doesn't show any signs of stopping. A number of developments are imminent. · Yourbus are taking over the running of the 109, which they will renumber the 114. This links Derby and Ashbourne via an indirect route but, along with the 113 which they have also won, will nicely compliment their Ashbourne network, with them already running the 110 and 111 services. The 114 contract involves a journey along the Swift route first thing in the morning and you have to question whether this is all part of a plan to launch an attack on Trent’s first route. Swift is becoming somewhat notorious for overcrowding and a detour around an estate upon leaving Ashbourne could be avoided by Yourbus but Trent Barton would no doubt face a PR backlash if they did the same. · The Y5 will be ran through to Nottingham (Friar Lane) from the 27th October. 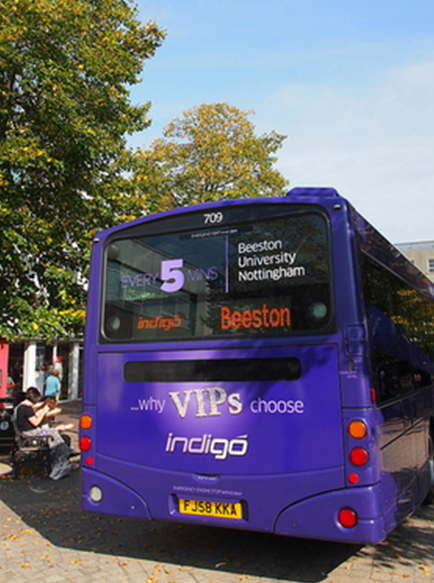 During peak hours, this will be a continuation of the current service from Beeston, following the Indigo route. Outside of the morning and evening rush hour, the service will follow the faster Skylink route into town. This comes not long after Trent Barton have reduced their service along the corridor from Skylink buses every 15 minutes to 3 irregularly timed buses, two on skylink (running 30 minutes apart) and one on the new Sawley Xprss. · The Y3 will extend from Ilkeston to Cotmanhay. This is a large estate currently served by a number of Trent Barton routes, principally the Two and the 23. There isn’t, however a direct link to Derby and I’ve often seen people transferring from the 23 onto the Ilkeston flyer. This could be a niche that works for Yourbus, but from what I saw yesterday, loadings weren’t great and I doubt that custom from that estate alone can keep the service going, particularly when there is a link to Nottingham, a bigger and arguably better, shopping destination, every 12 minutes. Furthermore, I noticed a 21 branded tempo advertising a £3.40 Ilkeston all day ticket yesterday. Yourbus certainly don’t seem to be throwing in the towel just yet then. They are a very fierce competitor who has had both success and failure in the past. Those that are benefiting are the passengers, many of whom have received faster, cheaper or more frequent buses, even if they’ve stayed with Trent Barton. Only time will tell if these latest ventures pay off for them. The photos included in this post are all (c) Matt Burley. Find his photos online here. Whilst in Derby Bus Station the other day, I overheard a woman complaining. Something about her journey that day "simply wasn't good enough," she was telling a member of staff. She was taking time out of her day, time that could otherwise be spent shopping, letting the company know what she was unhappy. This got me thinking, what exactly was it she was trying to achieve? As a law student, I am all too familiar with one of the latest imports from America; the blame culture. In a society where individuals are suing companies left right and centre, could it be compensation she is seeking? Does she want the ill effect she suffered from her journey reimbursed to her? I very much doubt it, she appeared to be in the over-60 bracket, she wouldn't have had to pay for her journey and is of the generation that typically has a 'keep calm and carry on' attitude. She was, of course, wanting her voice to be heard. She wanted to voice her concerns and criticisms to a company that would take them on board and act upon them. She wanted to be listened too. And, fundamentally, isn't that what we all want? Whilst we are by no means experts in every field, when we spot a problem or an issue, we want to be listened to and taken seriously by the company in question. We want them to appreciate and accept our point of view on a subject. And this was exactly how I felt last night. After posting my review on Zoom, I was delighted to receive an email off Trent Barton's Commercial Director, Alex Hornby. Even more so when he agreed with some of the criticisms of the new service and I was reassured to know that they were issues already being looked into. For those who haven't read the review, I must stress that my overall opinion was that it was a fantastic service, but there were two issues that I raised, one being the noise made my the buses in use and the other the overly flexible timetable. On the first issue, Alex commented "the noise of first generation Solos has always been a grumble of [his]". When senior management note the same issues as you, you know that, not only are you not going mad, but that this is an issue taken seriously Obviously there is little that can be done save selotaping a few hundred egg boxes to the engine chamber, that is without investment in new vehicles. On this, Alex comments "we'd love to have newer buses, but it's difficult to attract investment with a new venture like this." Hopefully, if Zoom does prove to be a success, we may see some newer vehicles on the route in years to come. My second issue was that the bus made such good progress along the A52 that it had to proceed very slowly along the rest of the route to avoid running early. Again, this is an issue clearly observed by the decision makers.What's more even more encouraging was the urgent attempts to remedy the situation: "We'll be speeding up the journeys within 56 days so expect a new faster timetable by the end of November" says Alex. Given increased car ownership and busier roads, there are few services that need services amending to speed them up and as such what is currently the fastest option for many will be able to become even faster. Of course, whilst Alex and the rest of the Heanor team have a big impact on what happens on Zoom, the travelling public will base their opinion on the team of drivers themselves. I've always found Trent Barton drivers to be friendly and the one I encountered on Zoom was no exception. Alex considers his team "a set of highly motivated and interested individuals" and despite the challenges they face in making Zoom a success, "the only gripe they have is that they’re worried that the buses may be too small." This is clearly a team that believes in the product as much as their managers do, which is certainly very encouraging. What is apparent from Alex's comments is that nothing short of perfection is good enough. This is a good service but until all complaints are settled then there is still work to be done. With managers having that sort of mindset, the customer can remain confident that they are getting the best service possible. For those into twitter, I would strongly advise giving Alex a follow here. Many thanks to Alex for getting back to me and giving me permission to use the above quotes. After a few weeks in York, I've spent a few days back at home. 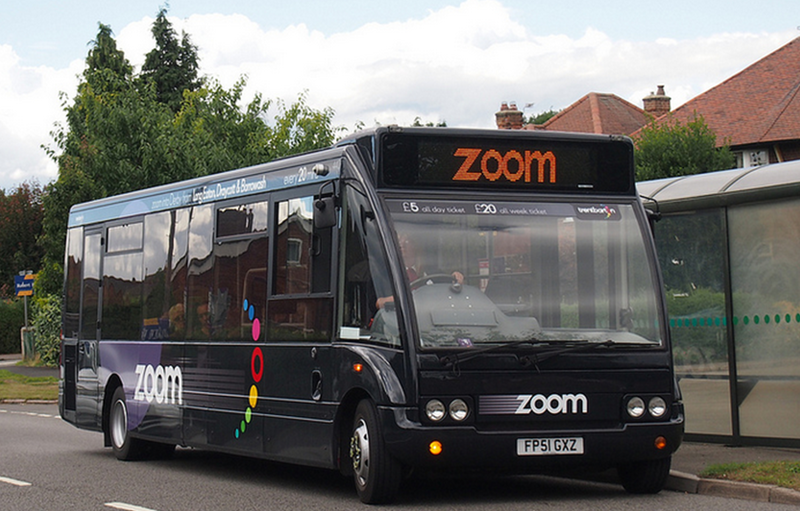 Having been launched just over a week ago, I decided to give Trent Barton's new Zoom service a go. Zoom was launched to provide faster journeys between Long Eaton, Borrowash and Derby. Starting at Long Eaton Green, it follows the Indigo route as far as Borrowash before branching off and joining the A52, running non-stop to Derby. The service uses four branded Optare solos, two '51' plates (fleet numbers 439 and 440) and two '02' plates (fleet numbers 446 and 452). All the buses have been refurbished internally and repainted into a dark grey and purple livery. As well as the improved journey time, Zoom has also Trent Barton's responce to Yourbus' 'Y5' service which mimics Indigo between Derby and Beeston (with the competition being extended to Nottingham in October). I took a journey from Derby Bus Station to Long Eaton. I took the 11:17 journey using bus 439. I was one of two passengers as far as Breaston, from there I had the bus to myself. Other journeys I saw had better loadings, and one bus I saw last night had a full seated load. I arrived at the stand quite early but my bus was already there, showing ample layover time which is always good for reliability. The driver was in the 'new' uniform (essentially a new tie and blazer with the new logo) and was very friendly; the zoom team has been hand-picked for their friendliness. The livery was stunning and looks far better in real life compared to photos, with the two base colours complimenting each other and standing out. The bold white logo also draws the eye. The inside was also very tidy, with the seats having been reupholstered with the new black fabric with recycled purple handrails so the outside colour scheme continued. As per usual there was an array of internal adverts promoting the service including various ticket options and the new Trent Barton alive real time system. The phrase "try me, like me, or get your money back" is on the outside, next to the passenger door, promoting the no quibble guarantee that Trent Barton prides themselves on. The bus left and arrived at Long Eaton on time. The bus went along the A52 at a fair pace but the engine was very noisy, which would have meant conversation would have been difficult. It seemed the bus made too much progress along the stretch of dual carriageway, having zoomed along we crawled to Long Eaton to avoid early running and even had to stop for a few minutes at a number of bus stops which is infuriating for passengers onboard. This overly flexible timetable was perhaps my main criticism. - the buses are very noisy and don't seem to be designed for dual carriageway running. This creates an unpleasant environment during the fast stretch. Overall, zoom is a good service. It provides a better product than was previously available and in a stylish way. With a few tweaks, it is a service with real potential. Hi everyone and welcome to the blog! I'm Oneman and I'm a bus enthusiast and law student living near Derby during the holidays and in York whilst studying. You may have come across me from my guest blog posts on the omnibuses blog, as 'oneman' or 'tbone' (Trent Barton one) on forums or through my Facebook and Twitter pages. Many question my use of a pseudonym, but it simply allows me to voice my true opinion without external pressures. There are however those out there who know me in person, so I'm not a total recluse! 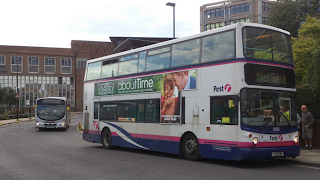 Both the East Midlands and York are home to exciting and evolving bus scenes. 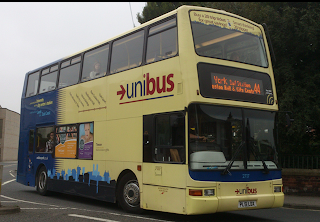 There is currently high profile competition between NCT, Trent Barton and Yourbus in Derby and Nottingham whilst Transdev and First continue to attract university students to their respective services. 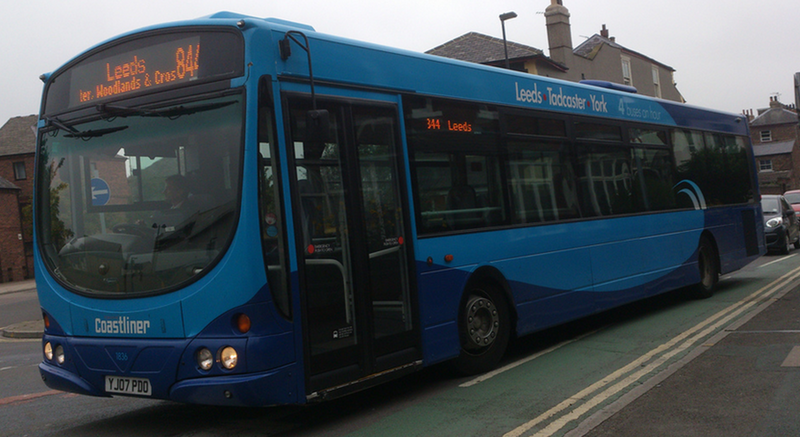 Arriva have recently gained a larger presence in York whilst Trent Barton continue to roll out their new look livery. The aim of the blog is to give updates on what's going on in both these areas. Being a law student with a part time job, I can't guarantee daily posts but I will try to update as often as possible. I hope you enjoy the blog, please feel free to spread the word and give feedback, and of course any guest articles are always welcome!